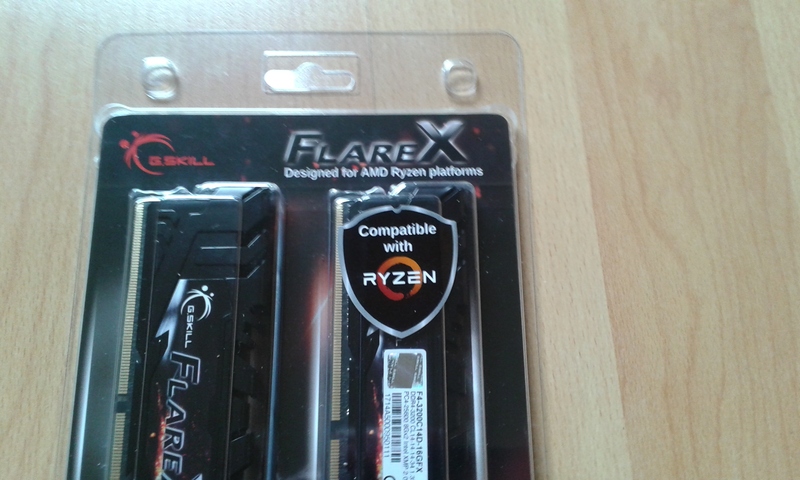 Hi and welcome to our test and review of G.Skill´s new FlareX series. When you look back in history of memory, the name “Flare” might sound familiar to you. Around seven years ago, a year after AMD released its AM3 socket and processors, G.Skill decided to release a memory model series optimized for AMD systems, including overclocking profiles for these which could be loaded. This was the original Flare series, which was very successful not only because of their AMD optimization but because they used well binned PCS X ics which proved extremely useful also on all Intel sockets from 1156 up to 1150. 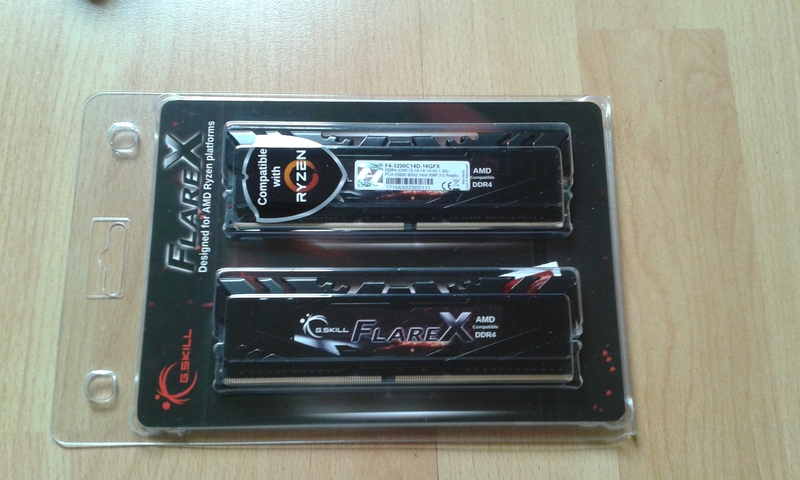 The memory is delivered in a classic blister packaging which contains the two modules and an inlay. 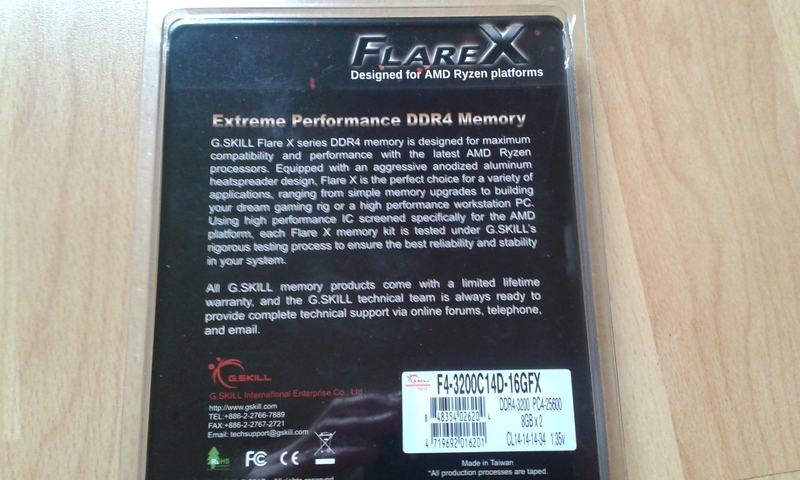 Apart from the series name, “FlareX”, the inlay provides the information the memory kit is designed for AMD Ryzen platforms plus a specifications sticker and some promo explanation plus the information about G.Skill limited lifetime warranty. The sticks itself come with a black matted PCB which has size (8GB) and speed printed on it, a pattern we know from G.Skill now from DDR4 start. The heatspreaders which cover pcb and ics is also designed in black colours, material used is aluminium and each side of the modules has a sticker which states the series name and that these are AMD compatible. One side also shows a sticker with exact specifications (DDR4-3200 Cl 14-14-14-34 1,35v, 2x8GB), the production date ( April 2017 in our case) on the hologram and the serial number which indicates ics used are made by Samsung (A500) and sticks were produced at week 14 of 2017. The sticks are build with 1GB ICs, this means there are eight chips used on only one side of the pcb, a clear indicator for us that at rating of DDR4-3200 C14, these are Samsung B-die chips, known for their good overclocking potential. Interesting fact, the sticks also state Intel XMP ready, means a profile on Intel platforms can be loaded. For further impressions you can check the pictures, personally we liked the design. 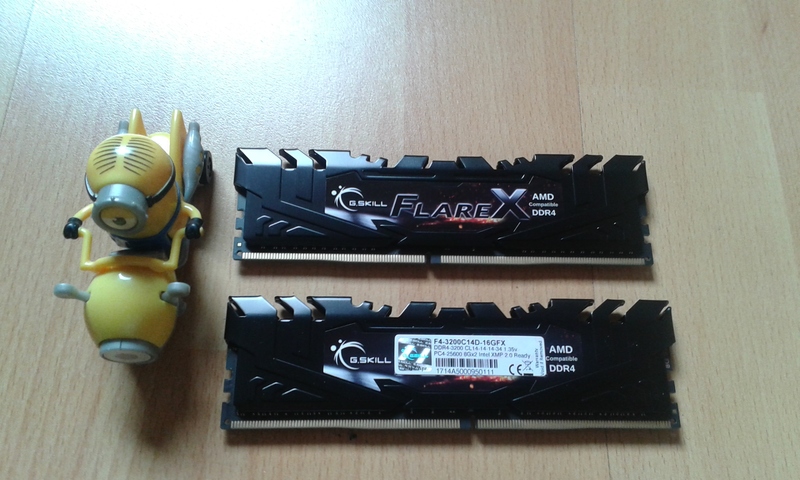 We started with the rated specs of DDR4-3200 at C14-14-1-4-34 by loading the MXP on our board. This worked perfectly at the rated 1,35v, so we decided to go on with some popular specifications of higher binned kits which we emulated. Moving up to DDR4-3600 16-16-1-16-36 1,35v worked perfectly, also DDR4-4000 17-19-19-39 was no problem within the 1,35v range. 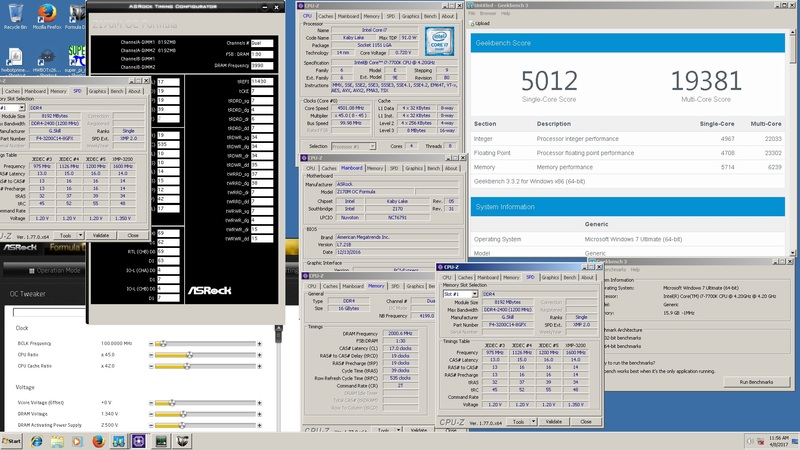 We then dialed in DDR4-4133 19-21-21-41 which also passed Memtest, Geekbench and Super pi 32m which we used as tests for possible daily settings. At next step we tried 4133 19-19 but failed, the fact we were able to end up at 18-20-20-41 showed s that this was due to TRCD/TRP limit at 1,35v. We show a couple of results with screenshots and it is a fair guess that this will give you a big variety of options to chose from, the fact these were confirmed with dos memtest and results also were confirmed with full available 16GB at OS should guarantee you that these settings are 24/7 stable for the tester. We started with some standard tests to evaluate needed voltage for different frequencies at Cas12-12 and 12-11. Moving up from 3600 12-12-12-28 220 1T with tight timings we tested 3733 and 3866 up to DDR4-400012-11-11-28 1T 220. During this process we noted that all settings worked, but that this kit we tested is for sure no low voltage kit. The 3866 12-11-11-28 setting already needed 1,85v set in BIOS, which is around 1,9-1,91v on our board due to the massive overvolting the MOCF does. 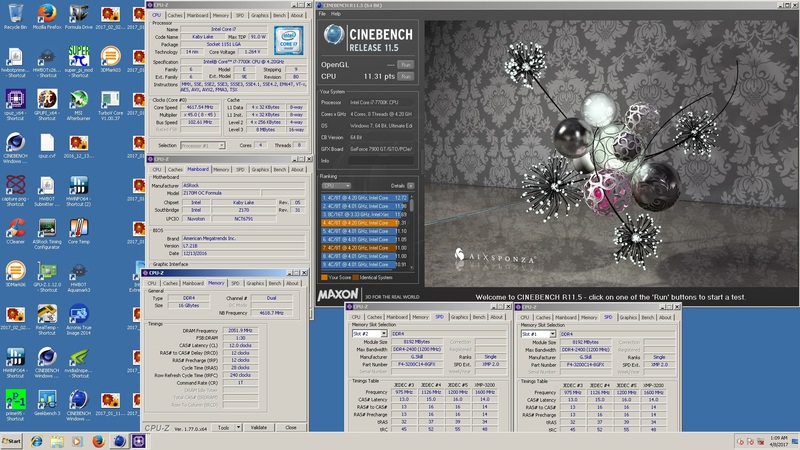 We were quite surprised then to see that 400012-11-11-28 and 12-12-12-28 worked around 1.94-1,96v BIOS (2,01-2,03v real) depending on the benchmark, we tested geekbench3, Cinebench 11.5 and 15, XTU and GPUPI as well as Super Pi 32m including a test of this at Windows XP with the legendary copy waza to optimize the result and cut down time needed. All worked. After the pile of kits we already tested in the past, optimism to go further was low, We had B-die based kits that opted out at at around 1,9v on the MOCF, average max voltage tolerated was around 1,95v which we already reached. Nonetheless we tried to achieve more. To make a long story short, our FlareX kit opted out around 2,05v BIOS, which is way above 2,1v real voltage. 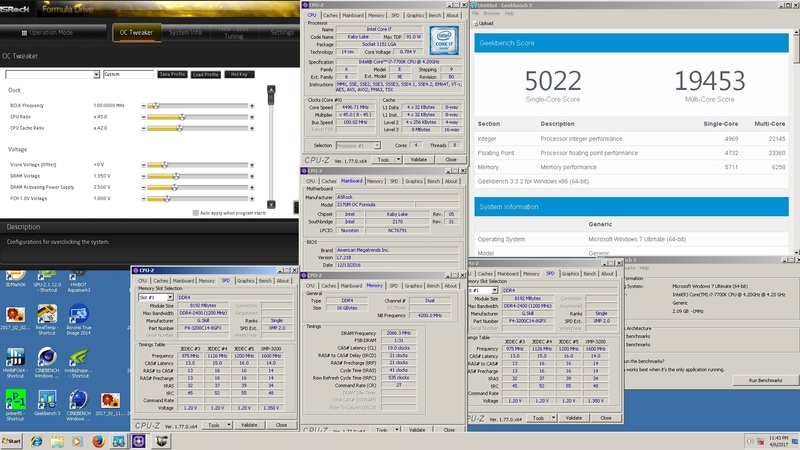 We achieved around DDR4-4080 12-11-11-28 240 Super Pi 32m with waza, above DDR4-4100 12-12-12-28 geekbench around 2,03v BIOS and were able to run Super Pi 1m and cinebench 15 at DDR4-4133 Cl12-12-12-28 240 tight settings at the mentioned 2,05v set in BIOS, around 2,13v real. This was end of the road for us on the used system. This was in fact much more than we expected after our recent experiences with higher binned kits. 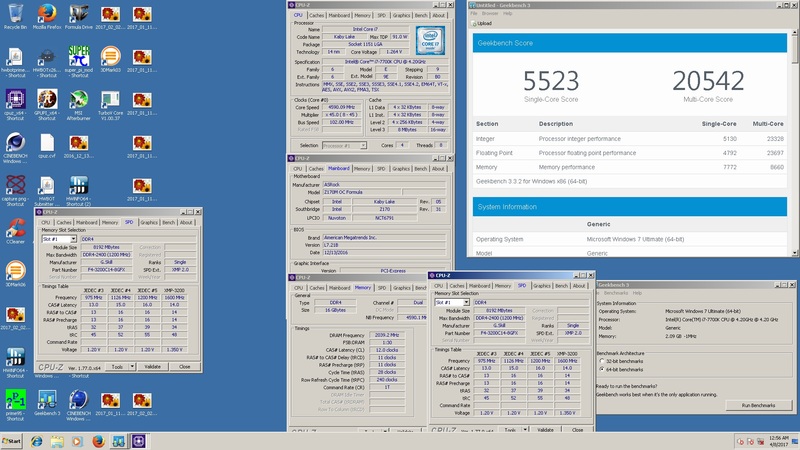 On a note, most of the tests were done on Windows 7 X64, if you ever dealt with high voltage/tight timing settings on Samsung B-die, you will know this needs maxmem set to around 4000MB. I mention this because I regularly get questions even from experienced overclockers and benchers which work with B-die for the first time, it is a ic specific problem that settings from 3400c12 upwards need this or you will lose stability at OS completely. Due to the limit on x32 operating systems, this is normally not needed there. It is never easy to rate memory kits nowadays. After the price explosion especially for higher rated kits over the last months, we needed to put all into a new perspective. So we start with optics and workmanship. For us the FlareX are a good alternative to models offered before, they use an attractive design and low heatspreaders which is quite rare nowadays, the all black design fits nearly all mainboard and cooler combinations. As usual, this depends on the view of the potential buyer, but the classic design and colouring should attract a lot of potential customers. 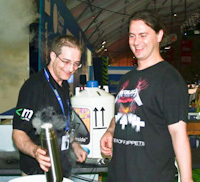 Crafting on our kit was flawless, quality of used components gave us no point we could criticize. On the daily oc, we were able to run these on an Intel system at 4133 at specs of kits 25-35% more expensive. For benchmark use, all benchmarks including Super Pi 32m with waza above 4000 C12 and also some 2D and 3D legacy benchmarks even at 4133 c12 offer good performance. We recently tested a couple of kits rated a lot higher than 3200c14 which failed on this. Another advantage of these, at least theoretically, is their compability and profile for AMD Ryzen, how big this advantage is above other B-die kits, with Intel only certification, others will have to judge. We simply saw that these are good daily oc Rams and are clearly capable of running high benchmark frequency even for ambitious professional benchers, which we found not too often lately on all brands and bins. The cheapest price at the moment at European price search engine geiizhals.de for the 3200c14 FlareX is 195 Euros, which is around 10 Euros more than similar rated kits and around 40-75 Euros cheaper than 4000 c19 and c18 rated kits in Europe for example. When I check the results obtained at the tests and our experiences with a lot of kits tested in 2017, we tend to give the FlareX a thumbs up, our sample provided solid daily and benchmark overclocking power. The complete package of optics and performance, plus the price compared to kits with similar specifications out of the box justifies a recommendation for these, nonetheless it is fair to say that at least for Intel systems 3600 c16-16 rated like ripjaw5 series are a decent alternative. Personally I like the FlareX, they beat my expectations and if you search a decent all around benchmark kit, they are a serious contender. Very nice review, and nice memory also !! !